I love the Guiltless Gourmet brand of baked tortilla chips! But lately, they have not been in any of the stores around me! Then I thought, why not just make my own baked chips? I searched the internet for methods and what I came up with is a version of several methods merged together. 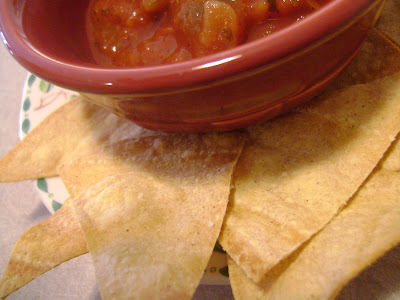 These chips are very easy to make and you can serve them WARM! As far as points go, it will vary according to the brand of corn tortillas you use. If you can find a brand that gives you a serving of two tortillas for around 90 calories and 1 gram of fat, you can have 16 chips for 1 pt!!!!!! WOW! The chips I made came from a brand that was 120 calories/ 1.5 gram fat/ 3 grams fiber. This works out to 2 pts for 16 chips. Still not too shabby when you pair it up with some zero point salsa. You can also use as much or as little salt as you like, or do away with the salt altogether and add your own mixture of seasonings! Preheat oven to 400 degrees F. Stack tortillas on top of each other. Cut into eight wedges with a pizza cutter. Scatter on cookie sheet leaving a bit of space between each one, and not overlapping any of the edges. ( use two cookie sheets if you need to) Season with salt and pepper to taste. Bake in oven for 8 -10 min watching carefully that chips do not get too brown. Let sit on cookie sheet for 1-2 min before eating. Yum! I'm going to make these. you will have to let me know how you like them. I think my days of buying store bought ones ( unless I need a huge amount for a party or something) are over! thank you Debbie! I hope you like them!